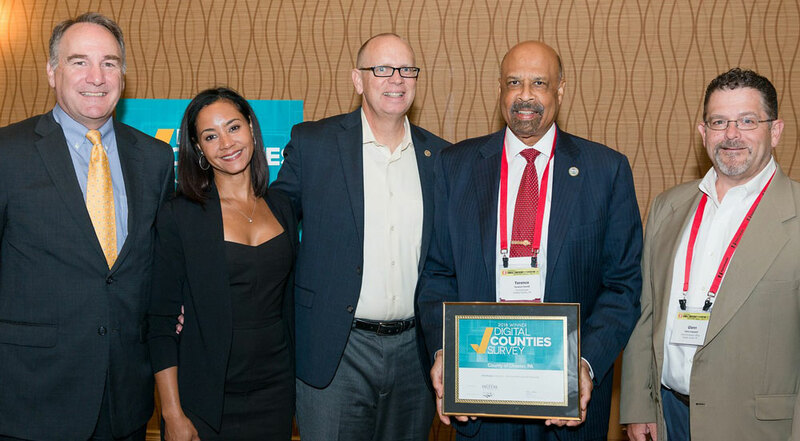 Chester County Commissioner Terence Farrell (second right) and Chester County Chief Information Officer Glenn Angstadt (right) accept the 2018 Digital Counties Award at last week’s National Association of Counties Conference in Nashville. Also pictured are (from left): Alan Cox, Executive Vice President, Center for Digital Government; Danielle Balmelle, Business Development Executive for award sponsors Acella; and Darryl Booth, Senior Vice President, Acella. WEST CHESTER — Chester County’s increased advancement in digital technology has earned a top ten ranking among America’s 3,000-plus counties. The Center for Digital Government (CDG) and National Association of Counties (NACo) have placed Chester County as ninth in the nation for best technology practices, including initiatives that save tax dollars, boost transparency, focus on cyber security and citizen engagement. This is the third consecutive year the county has received this award. The judges also highlighted the County’s robust social media operation that is focused on wellness issues. IT security is also a strong priority. “Even though Chester County has less than 100 IT staff, it has its own Chief Security Officer whose services are collaboratively used by neighboring jurisdictions. It has also strengthened its business processes that have improved competitive pricing for technology and saved the county significant amounts of taxpayer dollars,” the judges noted. Chester County Commissioner Terence Farrell and County Chief Information Officer, Glenn Angstadt accepted the award at the NACo Annual Conference.